@fred: How many pizzas did you order? Nice on Fred. My parents just left to Pori to see Bob. I have a nearby monitormixing gig so I couldn't join them. @FVH: what SPF do you need at latitude 61 degrees north? BURN PA N MA BURN! Yeah! That band is SO tight! Uno Dos Tres -- Quatro!!! Morning Julie and everyone! Great Suzi cuts - and DC5! Oh, man, been a long time since I've heard some of these. Thanks, Julie. Hi P-90, hi hep giraffe Sem! Mickie Most, from Peter Noone and Donovan to Suzi, what a variety of bands produced. Lauren Bacall of the Rock 'n Roll world! Lauren Bacall! I am down with that. Ohhh the Lauren Bacall of anything... Morning! "A plain black leather jumpsuit." Yup, that's all you need. Turned down ELVIS! She is truly something else! "Pinky Tuscadero Problems" - good name for an album/band. She was huge in Australia in the mid 70's when I was a kid. translation: "[actress who played] Pinky Tuscadero problems"
@P-90: Obviously, but I like to go for the form, not the context when thinking of good names. Though that explains a lot, since the original character was written off in favor of her younger sister. And here's the Marc Bolan turn. @MvS: wasn't critiquing the band name idea, you're right --and "Joni loves Suzi" (!!!) HA! I did read somewhere a long time ago that J. Jett read for "Leather"
This IS a great song! Notice how her vocal style is closer to 70s Ray Davies on this one. Tough girlz are kinda hard to cope with...ya just gotta love 'em!!!...hehehe...:)O(:.. Whoa, Gary Numan-esque song titled "Candy Man". If there's a rock and roll heaven, bring your spangled white leather jumpsuit. Nice Royal tribute, to the King. @Sem: I'm getting mine fitted with rhinestones in preparation..
Must definetely check the archive for the inerview. Wow, these backing vox are Suzi's? LOVE this song, never realized who the female was in this!! One of the Dark Side vocalists, appears Lesley was much in demand at that time. Off board but still listening. There is a puppy in the building..... I repeat.... puppy in the building! Cookies & cream--white w/ black spots? Interesting trivia, the numbers on the Suzi Cherry Red Records all start with "Glam"
"London's Herbal Fire Brigade"? First time I noticed that lyric. RIP...just saw him 2 months ago @JazzFest, he wasn't well and it was kind of a last hurrah. But so soon, I'm glad I saw him then. He created a new branch of the blues tree. ha! now THAT is a great cover! 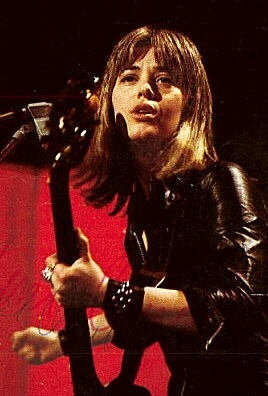 @Julie: Johnny did a hard version of "Jumpin' Jack Flash", that or any others next week would be a good tribute. Great interview with Suzi, Julie! And the rest of the show was pretty damn swell too. Thanks! Thanks for listening guys! EXCELLENT show and songs and interview! So glad you set that up. Thanks a bunch Julie! OMG my mobile is buffering some 5 minutes or so ... i was refering to pink floyd. Thanks Julie! First time to catch your show. Enjoyed very much. And what a great guest interview. I picked a good night to find you here. Great interview. I can still hear Detroit in her voice. That is 100% right on being up front. Right on, Suzie. Thinking like a man and being a woman. I love this woman. Great interview, Julie. Oh, and the great Laura Kennedy from the Bush Tetras. 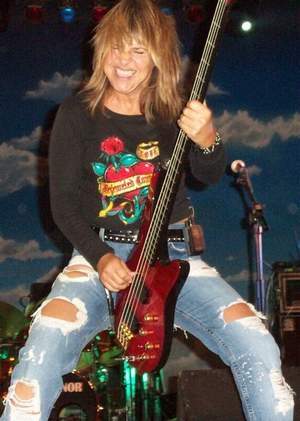 Yeah, there should be way more female bass players, but Tina Weymouth isn't the only game in town. And the American rock press of the time really didn't take Suzi seriously as a female role model, because they had this awful idea she was manufactured, but the fans figured it out. Thanks for listening, Cecile! 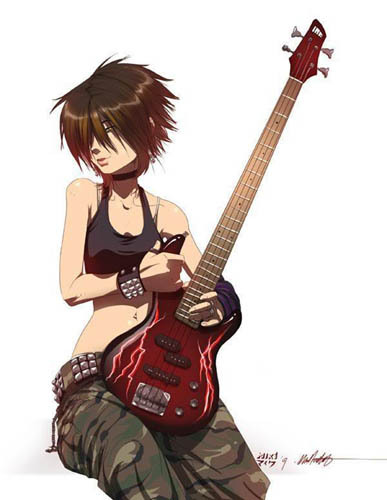 Yeah, I know there's other female bassists, I think I was a little nervous and tongue-tied. Hey, I can only imagine. Forgive my pedantic-ness.